I was very fortunate to recently have a fashion shoot with Caroline, who as well as being extremely attractive has the most amazing head of red hair. 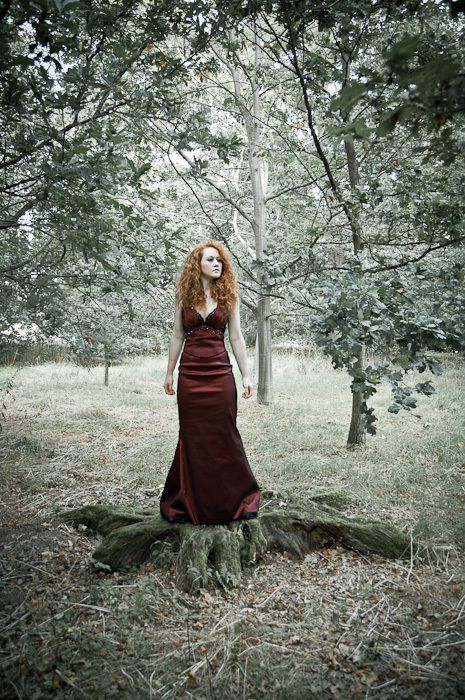 Not having done any fashion shoots before I was a bit stumped for locations, but while discussing locations to shoot she suggested a local National Trust property Attingham Park. The National Trust used to have a very poor reputation for allowing photography in their properties, but after a few emails and phone calls I was given permission to shoot Caroline within the grounds of the house. We started outside the main gate, where the gate provided a lovely out of focus background, and our antics also provided entertainment for visitors to the property driving through the gates, as well as some of Caroline’s friends standing outside the hotel opposite the gate. I think the framing works very well, and in the second image I have experimented in Lightroom with the Bleach Bypass preset to tone down the greens, and really make Caroline stand out from the background. On entering the grounds proper we found a lovely little wood and a tree stump which provided a suitable platform for Caroline. The Bleach Bypass preset has been used again to make her really stand out and provide a bit of atmosphere. When we first entered the property a very helpful guide told us the story of one of the Lords of the manor, who married a much younger city girl, and then proceeded to bankrupt himself and the family, thereby losing the property. He was also dressed in period costume so during his lunch we re-enacted the country Lord bringing his new young wife who was used to the city to Attingham Park, and a sepia tone seemed most appropriate for this type of image. 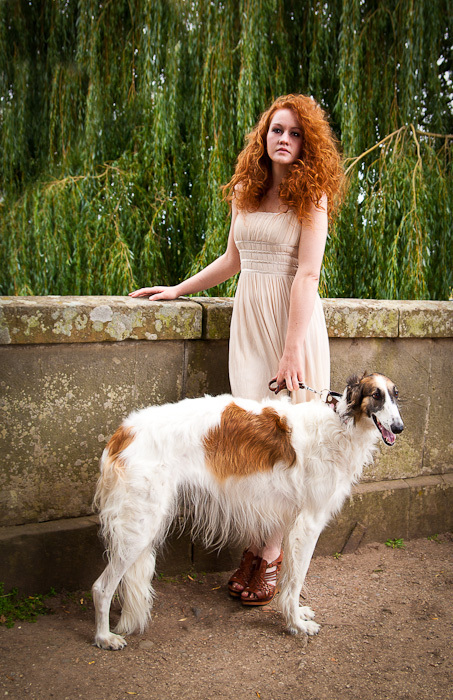 Then later in the day a very kind couple who noticed us photographing offered us their Borzoi dog as a model, given that the dogs colour matched Caroline’s stunning hair. So here’s a quick shot we did on a bridge. 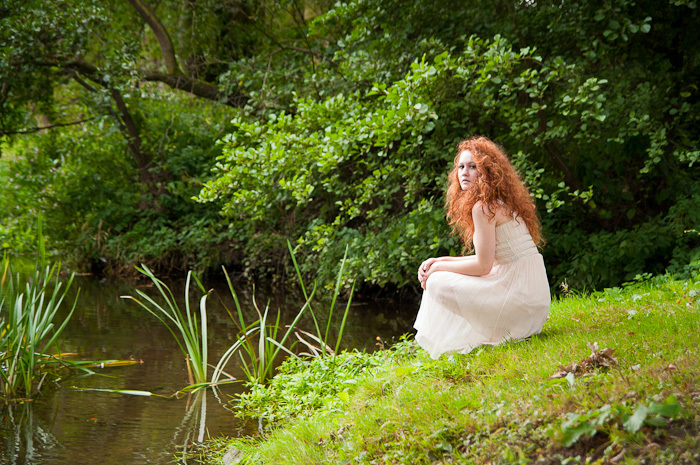 We only shot with Caroline wearing two outfits as she had to change in the toilets, so when she was in the more informal outfit I thought she would look nice sitting on the river bank, as the light was lovely and the dress became lovely and translucent. And finally Caroline had the urge to go walking into the river, so we thought that the bridge would make a nice frame. This however meant that I had to walk into the river to be in the right position to shoot, so in I went and I was up to my knees. It was freezing but we got some good shots. So a big thank you to Caroline for making my first fashion shoot so successful, and to the National Trust and Attingham Park for allowing us to shoot there. I would definitely like to shoot with Caroline again.